It is never easy being the boss, as you’re often put under the microscope. Even slightly raising your voice or an unintentional poor choice of words will trigger staff to think you are being an irrational boss. Here are 10 behaviours that employees think make a boss toxic, as listed by heawork tumblr, that you should avoid to prevent being labelled as a bad boss. As long as you are not guilty of any of the following, there is no reason for your employees to yell “Boss, you are fired! I quit!” before storming out of the door. Most staff understand that bosses uphold high standards and aim for perfection, but there is no need to get the team to redo a report just because the comma is not in the font you like, or what the Chinese would call “to pick bones from an egg”. Employees have their private life so it is best to stay out of their way after office hours. The sad thing about being the boss is not getting invited to team gatherings because let’s face it, you are the boss and whether it is good or bad, they want to talk about you when you are not around. Employees hate it when their boss says he or she trusts them with the task, but still keeps asking for updates at a frequency that makes them feel annoyed. It is a team effort, learn to let go and allow the team to excel in their own ways. As a boss, there are more important things to attend to than how staff like to decorate their desks, the sound of shoes tapping on the floor when staff walk around the office, or extra spacing on reports. In order for people to thrive and unleash their potential, try to focus on the big picture. Everyone is working on a tight deadline, and asking staff to start working on something new at 5pm or to finish a task that should take a week to complete within in three hours only adds to the pressure. Better time management is crucial in helping staff reduce stress and achieve better results. Sometimes staff can come up with really foolish ideas, but there is no need to say no to them every single time. A better approach is to help staff tweak their ideas and encourage them, otherwise they will stay silent even when they have a great idea. An indecisive boss is really tough to work with. Make sure to have a final decision before explaining to staff what is wanted from them. 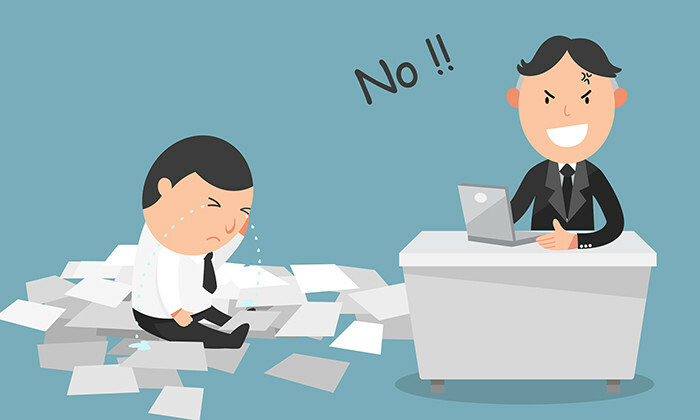 Staff also hate it when the boss simply turns down their suggestions several times, without any feedback, yet they have to take the blame when things go wrong. This is the biggest morale killer. Staff cannot stand it when their boss always takes credit for success while they have to take the blame when things go wrong. Implementing structural changes in an organisation can be a nightmare, but it's even more of a puzzling experience for employees. ..
Snoozing for 15 min at work daily boosts productivity, but bosses need to ensure staff don't see it as a "laziness perk", warn exp..